news - UbiQ news: three generations of DUB probes. UbiQ news: three generations of DUB probes. S2 pocket on your DUB? 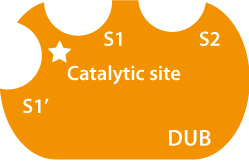 New DUB probes allow you to study DUBs that use S2 ubiquitin pocket binding to modulate DUB activity. DUBs employ different strategies to recognize polyubiquitin. 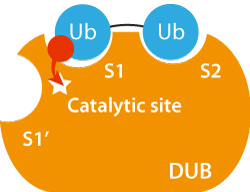 In addition to cleaving ubiquitins off proteins, DUBs can also cleave between ubiquitinated moieties within a polyubiquitinated chain to edit the ubiquitin signal. Some DUBs display remarkable preference for cleaving polyubiquitin chains of certain linkage types. However, how DUBs specifically recognize and hydrolyze different polyubiquitin chains is poorly understood. Recently a novel set of DUB probes was reported by Ovaa and co-workers. These probes enable you to study DUBs that use S2 pocket binding to modulate DUB activity and specificity. These probes target the S1 pocket and have contributed greatly to our understanding of DUBs. However these probes provide limited information on how DUBs process polyubiquitin chains. 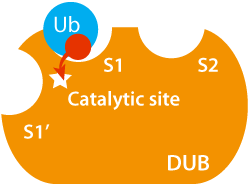 Di-ubiquitin-based probes with an electrophilic group between the two ubiquitins have been developed to capture DUBs with ubiquitins positioned in the S1 and S1’ pockets. 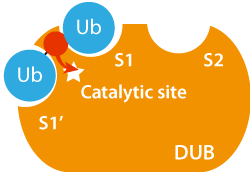 Di-ubiquitin probes that target the S1 and S2 pocket. These will be useful tools to identify DUBs that rely on S2 site interactions to fine tune their activity.